Sherman's Food Adventures: The Big Flat Pancake Co. Sometimes it is easy to lampoon the lack of good eats in the 'burbs. After all, many chain restaurants set up shop in the boonies in hopes of targeting a specific audience and/or for market research. 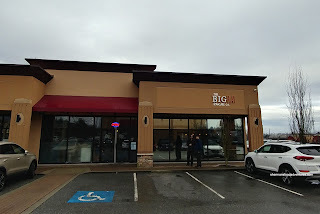 I'm pretty well-versed in suburban dining as I lived out in the Tri-Cities area for nearly 7 years. However, as mentioned in my post on Oz Korean Cuisine, the restaurant scene has really improved in the past 10 years. 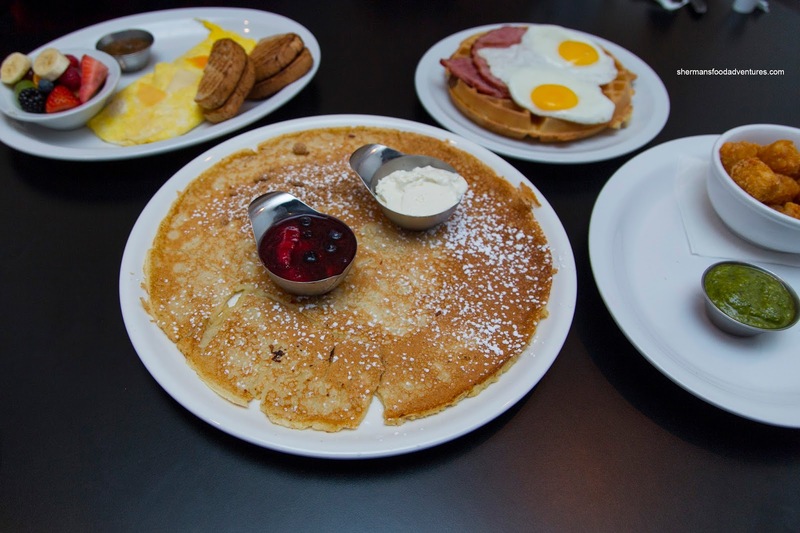 One of the newer spots to set up shop is The Big Flat Pancake in the old Wilbur & Sebastian's location. 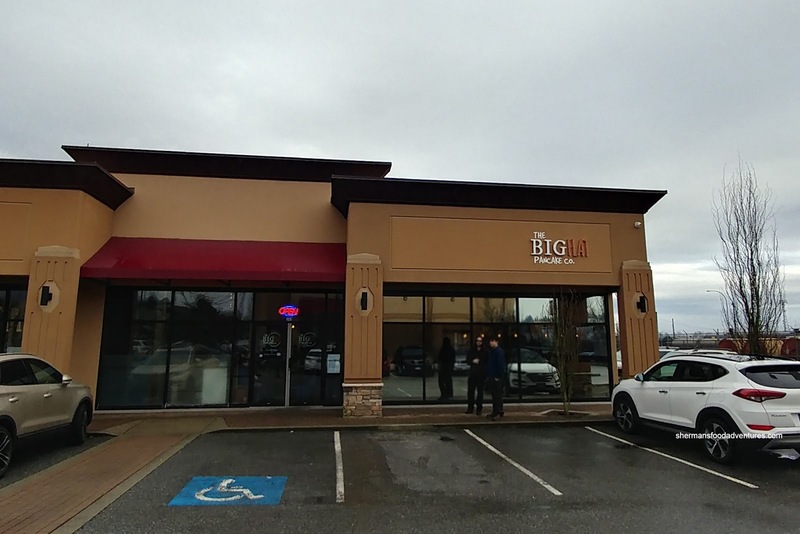 As much as there have been more choice out in the Tri-Cities area, the breakfast scene has been rather lacking except for the aforementioned chain restaurants. We headed out there to check it out. 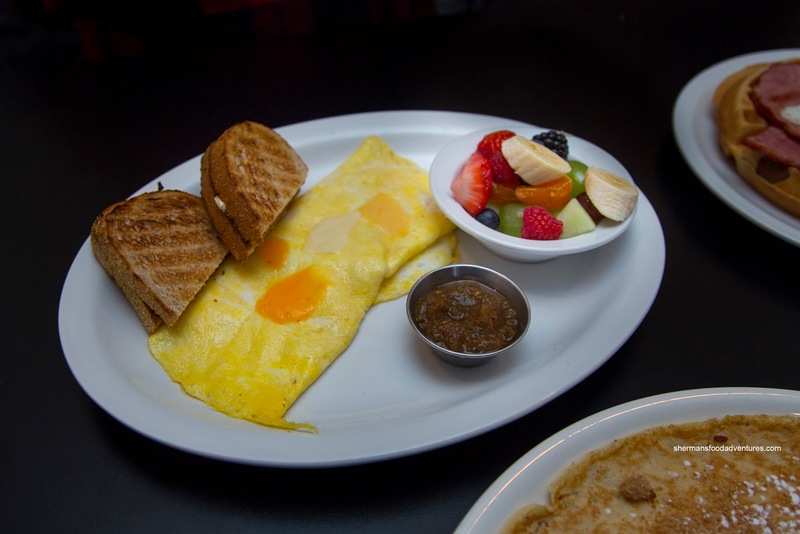 We ended up sharing 4 dishes amongst us including the 3 Cheese Omelet with multigrain toast, fresh fruit and house fire-roasted salsa. This was a modest-sized omelet that was neatly folded and filled with just enough melted gouda, cheddar and jack cheeses. I thought the egg was still fluffy and not overdone. It was really thin, which made it rather light to eat. The fire-roasted salsa was bright with only the slightest amount of spice to go with the tang. 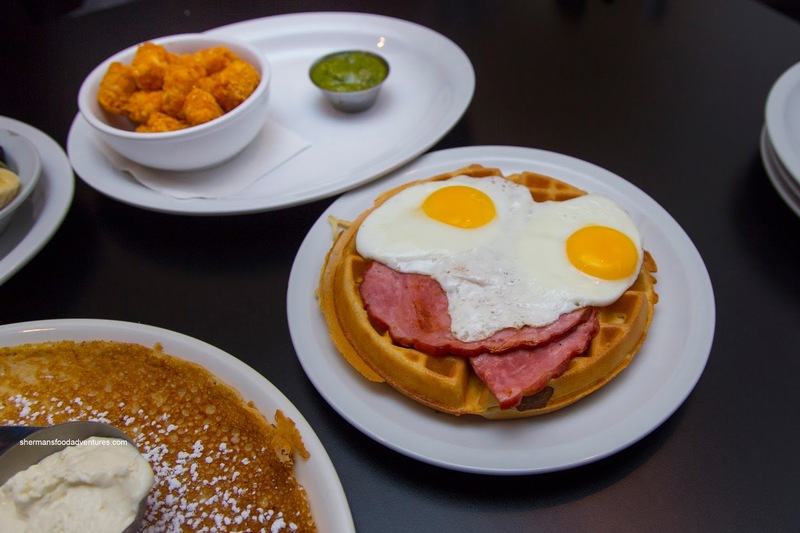 We also decided on the Farmhouse Waffle topped with thick-cut country ham and 2 sunny-side eggs. Frankly, there wasn't anything special about the waffle, but it was still good. I found it a touch dense while not crispy enough on the outside. We asked for sunny-side eggs and they were perfectly prepared with cooked-through whites while retaining a completely runny yolk. On the side, the side of tatar tots were on point being extra crispy. It came with a side of pesto that tasted eerily like the one found at Costco. Onto their signature items, we had the Hipster Hash Pancake featuring a thin-Pannekoek like crepe pancake topped with a dish of hash. It consisted of hashbrowns, country ham, back bacon, turkey bacon, peppers, onions, corn and tomato topped with a sunny-side egg (extra +$1.50) Hollandaise and avocado. For a hash, it lacked carmelization and searing. Therefore, the flavours were not developed and visually, it looked more like it was tossed together. Once again, the egg was perfect while the Hollandaise was creamy and well-balanced. 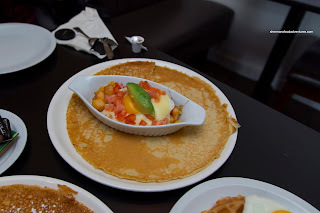 As for the pancake, it was similar to de Dutch but a touch thicker and spongier. We ended things off with the Four Berry Cheesecake Pancake with cream cheese whip, graham crumble and a compote of blueberries, blackberries, strawberries and raspberries. This was my favourite as the flavour was exactly as described. Overall, I felt that the BFPC has loads of potential, especially for its location. Prices are fair when compared to de Dutch and ingredients were fresh. Just a bit more consistency would put it over the top.